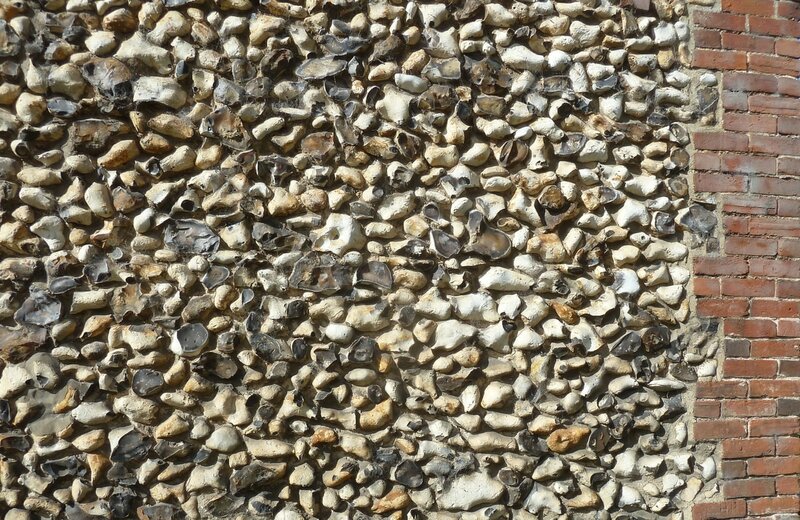 Fine knapped flint work (above) to south wall of the Guildhall in Norwich Market Square. Built in 1407 for civic government and the administration of justice. The east facade has splendid chequerboard squares of flint and ashlar stone. A later extension to the west end uses random shaped knapped flints with galleting (small flakes of flint) set into the mortar. The interior currently houses a good restaurant furnished as a Victorian court room. Many of the knapped flints in the exterior walls contain sponge larvae. ​The north wall of the Bridewell, reputedly the finest example of knapped flint in England. Built around 1325, originally as a dwelling, in the late 16th century it was converted to a house of correction. The flint blocks in the wall are so well fitted there is not a sight of mortar between them. Quite a few of the flints have this bullseye appearance caused by the conchoidal fracture of flint. It may have been done as a decorative effect by the flint mason or it could be later damage to the surface. How the craftsmen achieved the snug fit of such a difficult material to work is beyond me. Moving into the Norfolk countryside, a more rustic form of flint wall in Coltishall. This village is near Horstead where in 1865 Charles Lyell observed stacks of paramoudra in the quarry there. The wall is full of type 'A' nodules as would be expected near paramoudra. The two type of flints are always found in close association with each other as type A's are part of the development process of the larger Paramoudra typica. Dead centre of the image below is a small paramoudra, white flint with a hole in the middle. ​Type A are the elongated flints. These would be helpful in building as the protuberances would help key the nodule into the course of flint. One hundred metres down the road, the butchers shop has two Paramoudra typica by the front door, they have been there as long as the owner can recall. There are more to be seen in cottage gardens around the village.